Joshua is completely fascinated and obsessed with construction and road work. During our walks around town, we always stop to look at any construction that my be happening on our route. 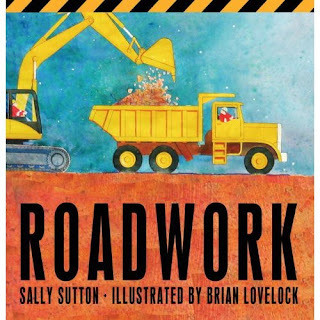 My son found this book, Roadwork, at the library last week and we have read it multiple times each day. It is a simple book, written for more like a two-year-old, but my four-year-old loves it. In this book the construction team needs to build a new road into a little town. Starting at the planning stages, the crew makes the road, paints the lines, lights the road and even plants trees and shrubs, until the road finally opens for traffic. The colorful illustrations on each page focus on the big machines (which is probably why my son loves it so much). Each page is a little rhyme; the first line is a short repeated phrase and the last line is a fun combination of onomatopoeia (words that spell the noise they are describing). Here is an example from the first and fifth pages. Plan the road. Plan the road. Mark it on the map. Hammer in the marking pegs. Seal the road. Seal the road. Make it hot and squishy. Spread the sticky tar and stones. I love the way this book has inspired my son. Today he pulled out his book and started "making a road" of his own. He started with a big paper to look like the plans, then he marked out the road (from the kitchen I could hear the plastic hammer pounding the floor). Then he pulled out all the construction machines he has, no matter the size, and used them in his road creation. It was beautiful pretend play. And he eventually recruited the help of his little sister and his friend who was visiting this afternoon. So funny to see them all using plastic containers as "pounders" to flatten the roads. In addition to this book, Joshua also found a great new video at the library, Real Life Action: at the Building Site. 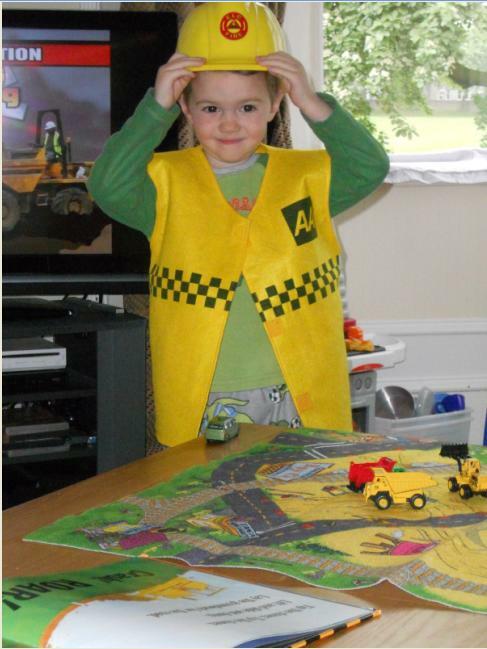 This DVD walks kids through a real life building site. On this huge construction site, they are in the process of building 400 homes. Two kids tour the construction site with the site manager and learn the process of building a house from start to finish. And we get to learn about all the machines that help out during construction. Joshua has decided that his favorite is the telescopic forklift (also called a telescopic handler). As the mother of a little boy, I am learning more about construction and machinery than I ever expected or needed to know. But everyday is a great adventure, and you never know when a big truck carrying a giant excavator will drive by. Thanks Joshua, it tickles your grandpa's heart. I too love my "toys" (Grandma's words for my tools) that get the job done to bring home the "bread"